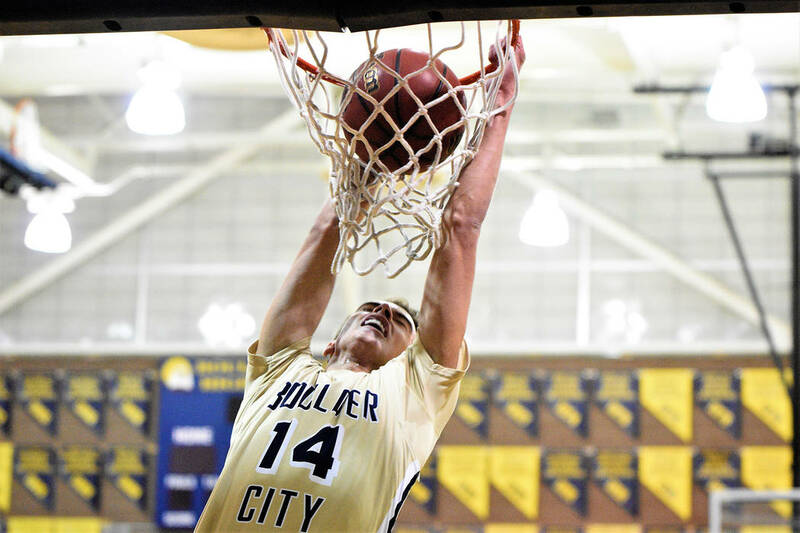 (Robert Vendettoli/Boulder City Review) Boulder City High School's senior guard Karson Bailey throws down a thunderous slam dunk against rival Moapa Valley on Tuesday, Jan. 29, 2019, in the team's 71-60 win. Getting past their biggest test Jan. 23, the Eagles defeated Chaparral 53-48 on the road, before routing Sunrise Mountain 61-31 on Friday, Jan. 25, and rival Moapa Valley 71-60 on Tuesday, Jan. 29. Capping off their week with an intense rivalry victory that mirrored a playoff atmosphere, spirits are high among the players as they try to compete in their first league championship season since 2012. Rebounding from a sluggish first half, sophomore forward Ethan Speaker changed the momentum of the game with a late 3-pointer before the half to give the Eagles a 33-32 lead. Speaker, the victim of a hard foul earlier in the game from a Moapa Valley opponent, was fired up against the Pirates, scoring a game-high 23 points to lead the effort. Scoring in double figures against the Pirates, senior Derrick Thomas added 21 points and Bailey added 12 points. Against Chaparral, the Eagles picked up a crucial victory, cruising for the opening tip and leading 26-15 at halftime. In double figures for the Eagles, Thomas scored a game-high 21 points against the Cowboys, Bailey added 16 points and sophomore forward Matt Morton added 10 points. Against Sunrise Mountain, Thomas scored a game-high 19 points while Speaker added 18 points. The Eagles defeated 4A Eldorado 60-49 on Monday, Jan. 28, in a nonleague game. Thomas scored a game-high 24 points, Speaker added 15 and Bailey added 10 points. The Eagles will try to extended their winning streak Friday, Feb. 1, at home against rival Virgin Valley, before hosting Somerset Academy Sky Pointe on Monday, Feb. 4, and Chaparral on Wednesday, Feb. 6.